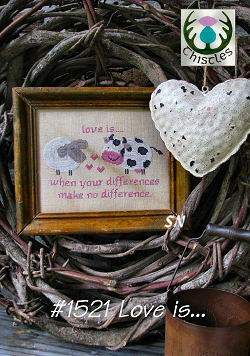 Charming Arrivals by Thistles -- Direct from The Netherlands! 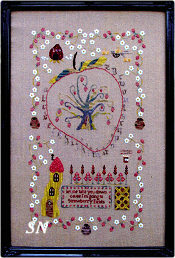 Liezbeth Gottshall has quite a collection of delightful Cross Stitch designs... you're going to love her things! 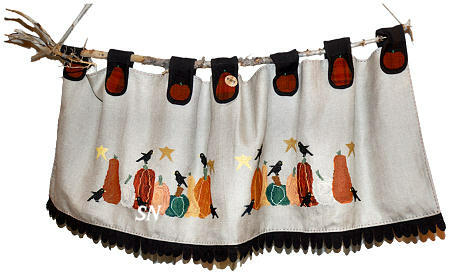 We have a fun pumpkin curtain (! ), cute baby pillows, day-of-the-week pin cushions, a multiplication table, stitched and stuffed sheep (you can make a flock of them! 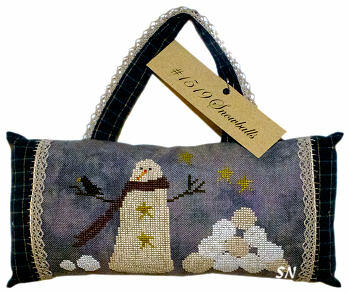 ), a snowman penny rug, and some darling Christmas pillows! 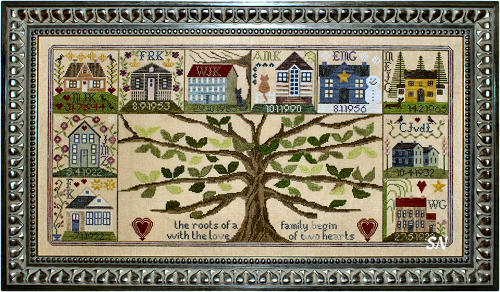 Everything is offered in chart format and stitched with Weeks and Gentle Art flosses. Unique designs, some different finishing ideas, Thistles is a new designer line for us in the shop! All different seasons this time... all presented in charts. 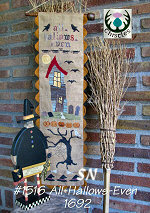 I chose the Spring and Summer designs to show here... Winter and Halloween are on the inside Thistles page. Everything is coded for DMC floss as well as Gentle Art hand-dyed Sampler Threads. 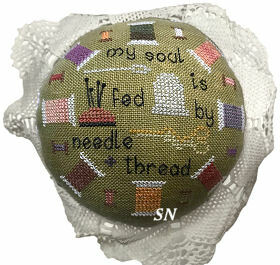 My Soul is Fed - 'by needle and thread!' 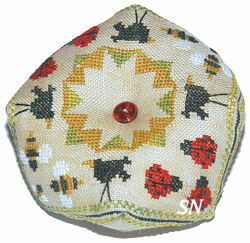 A sweet pin cushion design with tiny spools, scissors, and the verse. This was a challenge to photograph because she puffed it nice and round! Super cute! 7 Houses on the Beach - Aren't they cute? Perfect little dressing houses, you just want to change fast and get out onto the sand! Just 61 x 67 stitches - or 4-ish inches on 32ct. To The Easter Party - The little chick is counting on the hen to get that wagon of eggs to the party in time! The fabric is Weeks Cappuccino, but I think this would be pretty on a pastel yellow or blue, too... and I love dark Easter Eggs! Stitch count is fairly large at 160 x 80! 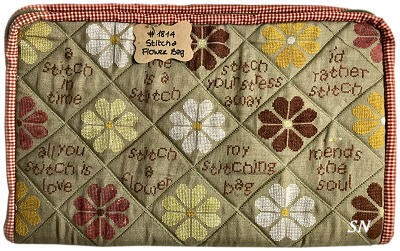 Stitch a Flower Bag is a cute repeating design - each flower or verse square measures 60 stitches from side point to side. Liezbeth does include the finishing instructions in here to make her sewing case, but since I don't sew - I cannot tell you if they would make sense to you or not!!! So... I think I'd make two-sided pin cushions - verse on one side, and different colored flowers on the other, and make a set of 8 matching cushions! 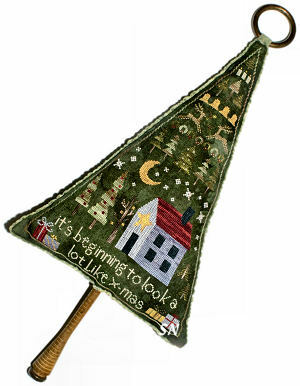 Little Cabin in the Pines - This is a run little round... it is 108 stitches in diameter. I love all the different trees! Halloween Collection - A spooky little shelf... I think it'd be fun to add glass beads to the spiders for eyes, and some furry for legs and the kitty, and maybe some opalescent metallic for the web! 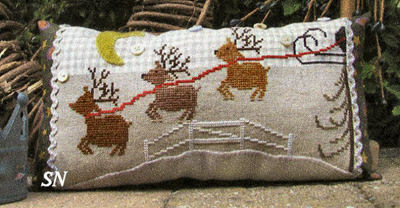 Stitch count is 136 x 212, so it finishes approx 8-1/2 x 13 on 32ct - actually quite large. These three winter-y designs are all totally different in finished size and shape. I am sure our pics cannot convey that enough, but I chose to group them by season... so that's just what we got! Wintersheep is a little pin cushion! All the little fluffies are wearing beanie hats. Although this is stitched with cotton floss, I think it would be awesome stitched with Gentle Art's Simply Wool on the sheep and hats instead. This finishes just 3 x 8. Snowstop is another whopping huge piece! Liezbeth has him finished into a charming door stop! 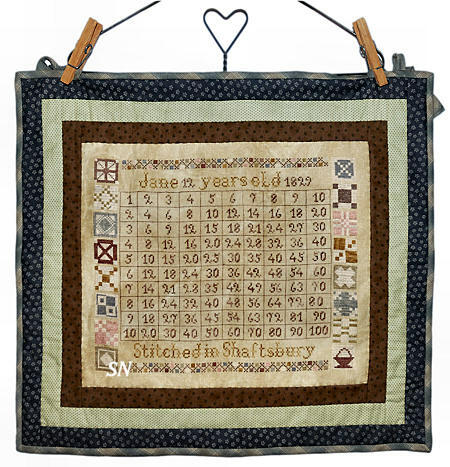 He is stitched over two on 18ct natural linen, and although she has him coded for Gentle Art Sampler Threads - we think he'd be better worked with #5 Pearl Cotton! He finishes 16 inches tall and he's 11 inches wide... wouldn't he be fun perched in front of a door somewhere? Fairy Wooly Winter - 'Bring frost, bring snow, come winter, bring us holly, isn't winter jolly? 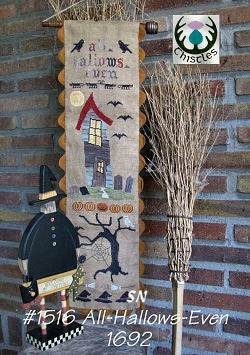 This banner finishes a whopping 7 x 32 on 32ct linen - stitch count is 103 x 477! 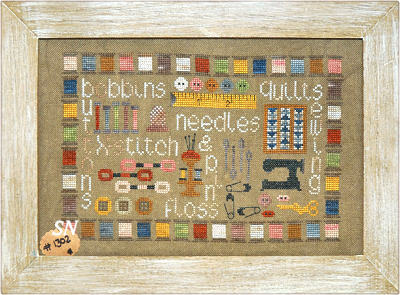 You can always split up the sections and stitch those individually, but this is charming as one, long, skinny piece! It's Beginning to Look a Lot like Xmas! Well... thank goodness it's really NOT right now... but some places ARE still getting snow! Thistles has a super-cool new design that stitches up into a triangle shape that she has finished into a stuffed Christmas tree! 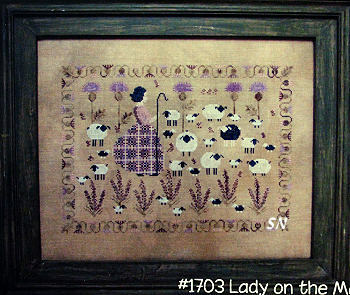 Stitched on Dames of the Needle's Lush Meadow Dark Green hand-dyed linen... hand dyed linen is included with our charts. That dark green fabric just makes this darling design present so well. 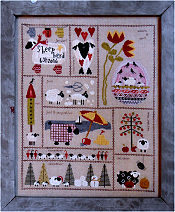 Worked with Gentle Art Sampler threads, this is over-the-top-charming!!!!! It'll finish an impressive 13 inches or so, and will make a delightful decoration! This is a fun Springtime scene... I especially like the flower vines along the sides. All the houses are a little different... not so much the birds! 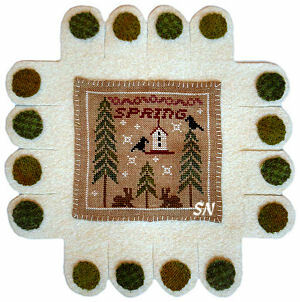 Stitched on 36ct, it'll finish a petite 6 x 7 inches, and it is worked with Gentle Art Sampler Threads or DMC. Thistles has a couple of cute charted designs that we brought home from Market last month. 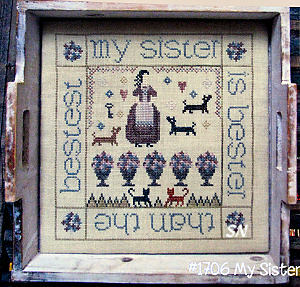 My Sister is the Bester -- You could switch out that Sister reference to a friend... this is stitched with DMC or Sampler Threads and finishes 10-ish inches on 32ct. Lady on the Moors -- (Do we have Moors in the US?) Pretty lavenders and greens in this -- DMC or Sampler Threads, it finishes approx 12 x 10 on 35ct. 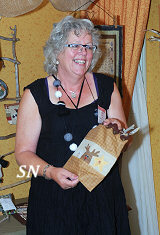 Liezbeth from Thistles has darling new things!!! Family Tree is the largest of them... it is really neat, too! *The roots of a family begin with the love of two hearts. 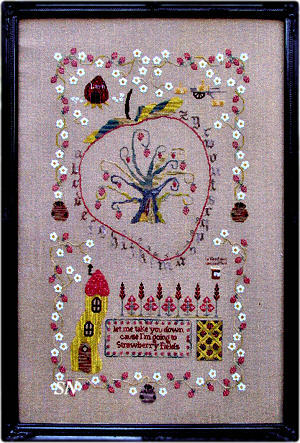 * There are 10 houses surrounding that tree... and each is personalized with initials and dates of people in your family! It looks like births, but you could start with marriages and sets of initials... if you have lots of siblings, you could choose a house for each family... skip the tree all together and just arrange the houses! I don't know, but the houses are all really cute! Coded for Sampler Threads or DMC, there are a whopping 29 different colors in here, and it finishes a commanding 25 x 13 on 32ct! Presented as a chart. 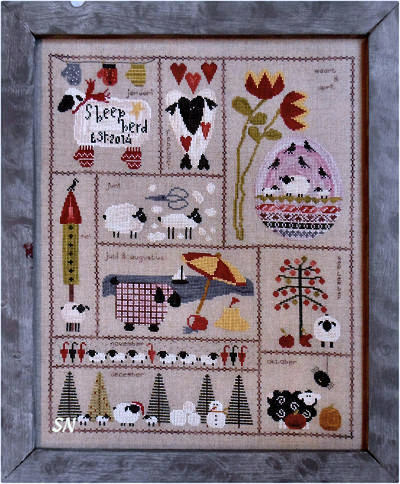 This is a cool design -- you get the charted sheep (90 x 130 stitches) underneath a tree, along with three more line drawings to do him in punch needle or wool applique... and then a general layout guide to assemble all of it into the 18 x 36-ish inch hanging quilt! Get this pattern, study it a bit, and decide what you want your finished project to be. Lots of options, and they're all real cute! Just a quick little guy -- he needs a little shaping -- like his snowballs! Presented as a chart, he finishes approx 6-1/2 x 4. This is cool! Who knew squares could be sheep??? *Theres a white sheep in every flock! * Nine of these little guys -- all with patterns on them -- are arranged with such symetry. Hand-dyed flosses or DMC, these finish approx 14 inches square on 32ct... I think she has used 20ct in the model pic -- so this pillow is 20 x 20!!! Really creative and contempoary... very eyecatching! Don't these houses look like those little painted wooden block houses??? 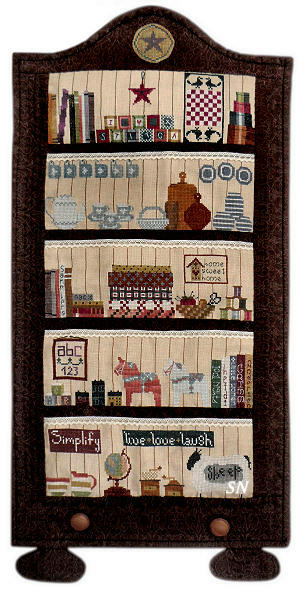 Stitch this row of houses on just about any fabric you want... Liezbeth has chosen a 20ct for this -- so her pillow is 28 x 5! Actually, bigger, because she has that cool row of mismatched buttons going across the top. Very pretty, this is coded for regular DMC floss. If you want to work it on the larger linen -- we suggest #5 Pearl Cotton -- just like the Sepherd's Bush stockings. It covers well, is super easy to use, and comes in all the good colors -- DMC OR Hand-dyed! Snowballs -- aka snowman parts!!! 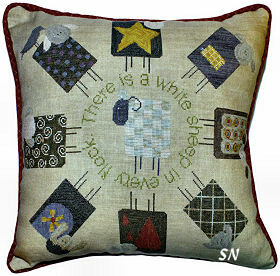 Choose any fabric that will let the white show up, this finishes approx 6 x 8 inches on 30ct. 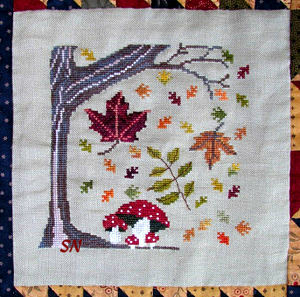 A Tree for Me Winter -- A super-easy piece to stitch -- lots of solid area, this finishes approx 6 x 6. 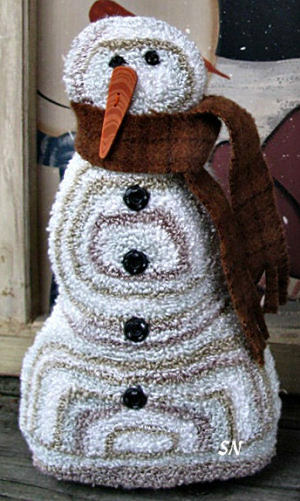 Again, choose your favorite fabric, maybe add some glisteny thread to the snow? 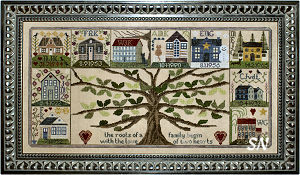 A Tree for Me Autumn -- Companion to Winter Tree, Lizbeth includes the finishing instructions for her little penny rug mini-mat finishing. 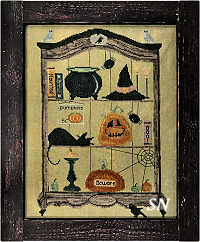 All Hallows Eve -- A skinny hanging trimmed with the 1-inch gigantic rik-rak, this is coded for Gentle Art Sampler Threads or DMC and finishes approx 8 x 30 on 30ct. It'd be cute with a smattering of buttons added, and some metallic in the spider web. 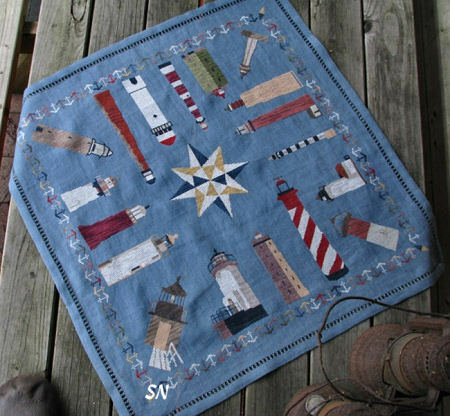 You'll need a generous cut -- this finishes 22 x 22 -- of 28ct Blue Spruce Linen -- to highlight all of these lighthouses. Organized by a border of anchors and accented by the neat compass star in the center, it features lighthouses from The Netherlands and New England -- and Liesbeth has identified them all for you. Coded for DMC as well as overdyeds, it uses 22 different colors and was really pretty in person when we saw it stitched at Market! Offered as the chart. Quite the yearly schedule for these little guys! Sheep Herd has a winter/mitten sheep, Valentines, an Easter Egg with sheep on it, sheep getting sheared in the summer, apple picking, fall rains, one being taunted by a Halloween spider and one wearing a stocking cap grazing in an evergreen forest! 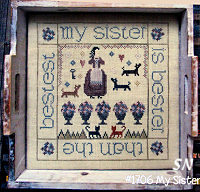 With a stitch count of 211 x 259, this finishes approx 14 x 16 on 32ct. Worked with Gentle Art and Classic Colorworks hand-dyed flosses, it is cute! Check out the plaid sheep at the beach in there! 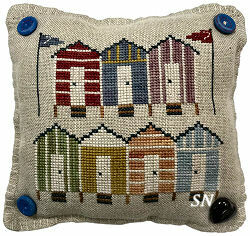 A PUNCH NEEDLE design, this is darn cute! This little guy stands about 7 inches high and is 5 inches 'fat.' He is punched in regular DMC -- white, 453, 644 and 3756. Liezbeth suggests a JABCO sticky-outy carrot nose for him, and maybe if you're handy -- a little knitted scarf??? Offered as the line drawing you will need to transfer onto weaver's cloth. Another PUNCH NEEDLE design, this one DOESN'T HAVE the punched background! 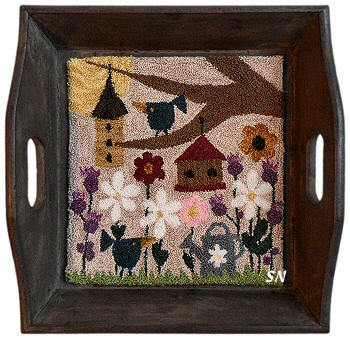 It's a delightful garden scene -- the birds are so cute -- get someone to make you that darling little tray. This is coded for either Gentle Art or DMC threads. Offered as the line drawing you will need to transfer to Weaver's cloth. A sweet penny-rug finishing treatment on this, it is worked on Weeks 30ct Cocoa Linen with Gentle Art hand-dyeds or DMC flosses. Bunnies and Pine Trees, simple and cute. Offered as the chart with the actual-sized penny rug finishing template. 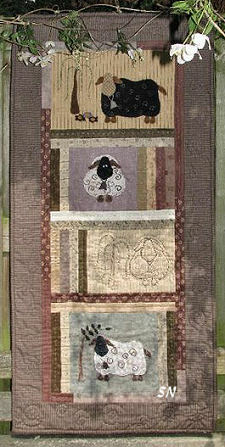 This is a set of 6 designs that is offered in separate chart format... but Liezbeth shows finished together into a quilt. (details are on her website.) Each is a different size, two are stitched on Olive Green Linen, and four are on Dirty. 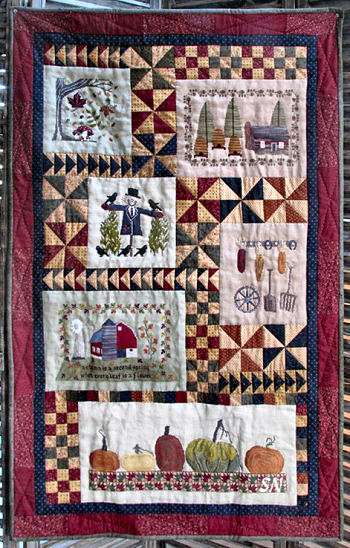 Jury is out on fabric choices... take a look at the quilt and see what you think. You'll need overdyed flosses or DMC for everything -- it's a cute set. #1505 Tree measures 6 x 6. 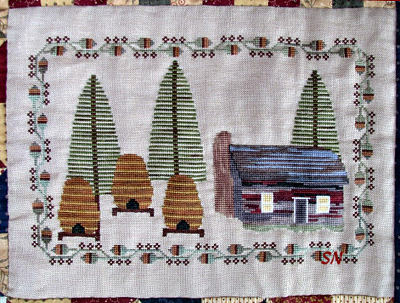 #1506 Log Cabin is 7-1/2 x 10-1/2. #1507 Red Barn is 12 x 7-1/2. #1508 Pumpkins finish18-1/2 x 7. 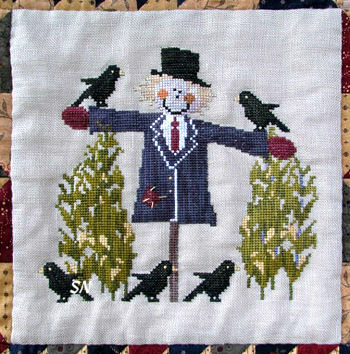 #1509 Scarecrow is 6-1/2 x 7. 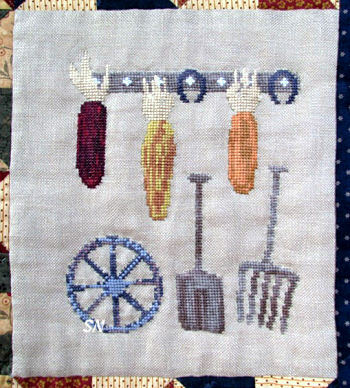 #1510 Garden Tools measures 6 x 7. 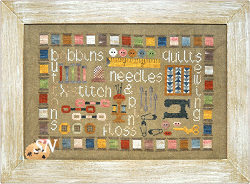 Spools, skeins and bobbins, buttons, pins and cushions, this 100 x 150 stitch count sampler is a perfect sampler for a 'needler!' 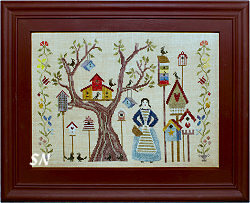 Worked with Gentle Art Sampler Threads or DMC, it finishes approx 6 x 10 on 30ct. There are so many fun things you could do with this... stitch the spools with Satin Stitches, actually loop the thread in the skeins, use actual safety pins and straight pins on here instead of stitching them, buttons are obvious, there is a tape measure on here -- maybe a bit of an old torn one would be cool -- and the little quilt could be a REAL little quilt! Just a fun piece all around, offered as a chart. Well, I don't know who Jane is... but I bet she had to learn this multiplication table... and it took her a long time to do it! Somehow or another these old tables always draw comments and are very eyecatching as needlework hanging on your wall. I guess all the numbers look daunting, until we remember that all of us learned all of this at some point, and were probably miserable during the process -- maybe like Jane? Finishing approx 10 x 13, it is a charming table with some softly colored quilt blocks lining the sides. 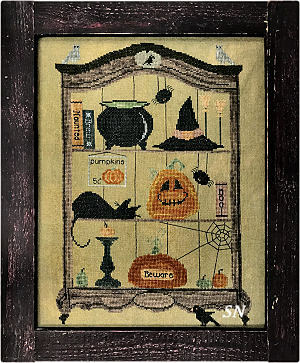 A fun medley of pumpkins, squash and crows... this displays a fun finishing idea. Each 'side' of the curtain is 80 x 185 stitches -- the design is reversed on the opposite side. (So, you only have to stitch this once if you want to make a pillow or something, and it could be 5 x 12 on 32ct.) Actually, it is finished as a curtain valance worked on 20ct linen. 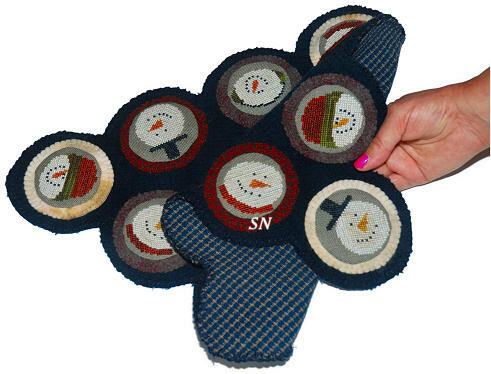 It features woolen hanging tabs at the top and penny-rug-flaps along the bottom for decoration. 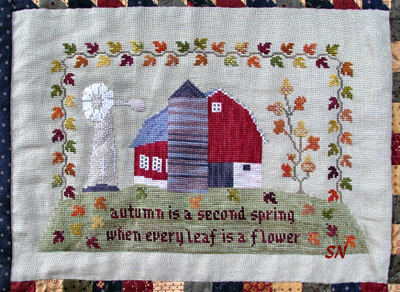 Really, really cute, I see this hanging in a cabin kitchen window, or a tiny powder room. Worked on 20ct linen, our 18ct will work as well... it just needs to be washed and dried in the dryer to get it soft and drapy. You can use DMC or hand-dyed floss -- at least 3 stands in the needle -- or size 5 Pearl Cotton. If you choose to make the curtain... just hang it in the most charming little window you can find! Holy Sheep -- this is cute! 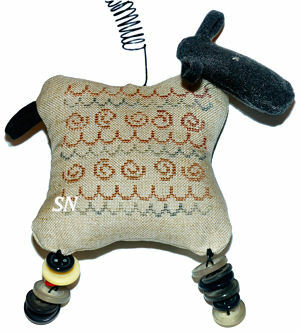 Swirls and scallops decorate these silly square sheep -- your challenge is to find cool buttons to string for her legs and maybe a funky base for her as well. You'll need a schnigglet cut of black wool to make her face, and bits of any fabric you like to stitch her... you even choose whatever colors of thread you like. Her little legs are simply lengths of heavy thread knotted with several buttons on them, so they jiggle a lot. If you put Cornelia on a springy base, she'll jiggle around. One of the pics on the cover features an old C-clamp as the base -- how cute to simply clamp her to the edge of a shelf or obscure table or lonely windowsill off in the corner of the room?? Offered as a chart, this is really a clever design! Oh, this is full of what-nots, curiosities, toys, antiques, even a pile of fabrics, a sewing basket and tiny 'home sweet home' sampler!!! I love the part that this whole thing is stuffed full of *stuff* and then, there at the bottom is a sign that says 'Simplify!' What a fun piece! 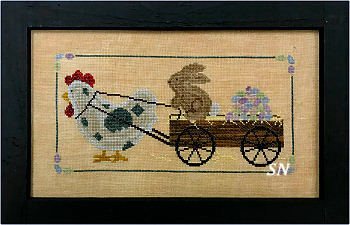 This measures 150 x 265 stitches -- so approx 9-1/2 x 16-1/2 inches on 32ct. 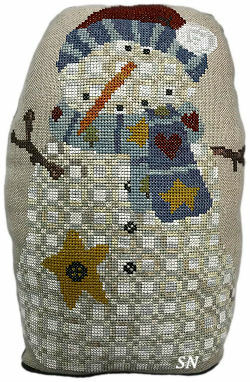 Lots and lots of Gentle Art Sampler Threads or DMC colors, this is another piece that could handle any number of bitty embellishments you have unclaimed in your stash. Liezbeth has finished this in the shape of a little piece of furniture! Then, find a MANGY wood tray or box. LOOK at what Liezbeth has done... she's found assorted and unmatched cabinet knobs (Anthropologie has tons of cool ones... old glass, mangy metal! ), screwed them into the tray and hung her cushions!! Super cool and creative! 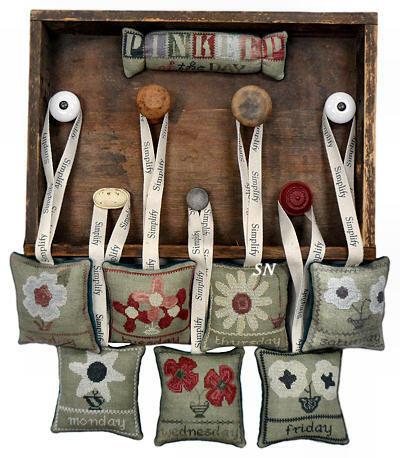 And the little flower cushions are delightful -- don't forget about them! Strawberry houses, strawberry vines, a jar of jam... and a few lyrics from The Beatles... this is an interesting sampler with an equally interesting little mushroom house down near the bottom. Can you see the Strawberry outline in the center around the tree -- it has an alphabet all around it. 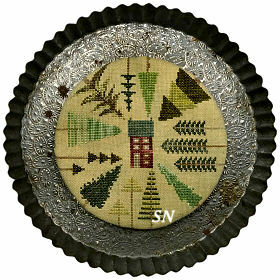 This is a small biscornu pattern that is shown mounted into the center of loops of wool -- like greenery, I suppose? Very spring-y in feel with the ladybug, birds and bees... I don't understand the wool in the background, so that part of the finishing is up to you! Gosh, this is really different and awfully cute. 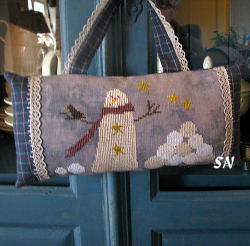 You are stitching only 4 different snowman heads -- 25 x 25 stitches each -- on 32ct light blue, grey or whatever color linen. Then, you are mounting them on various colors of Weeks Wools to make little *Pennies. * You'll need some #8 Pearl cotton for the Blanket Stitches. Then, arrange them all in a pattern and either attach them to each other -- or mount them onto a larger base piece of felt for a little doily/rug. They all look different if you vary the scarf colors and wool combinations... We can choose awesome cuts and patterns of wools for you on this... I'd get 6 Schnigglet cuts and one main 1/4 yard cut of wool for the base. This is darling! Oh gosh, this is cute! That same little fence as the sheep, this time we have the reindeer flying through the sky with the hint of the sleigh behind! Check out the finishing fabrics... choose something cute for the sky, and something coordinating for the sides -- and rik rak to cover the seams.